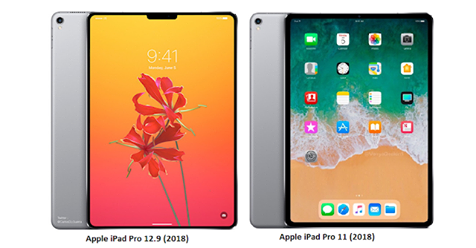 Apple have been making some great strides over the years which is evident with the latest iPad Pro 2018. To be honest, this isn’t anything new as most of their tablet offerings always end up being the best-designed tablet out there. And this isn’t any different. And that’s the thing. As great as the iPad is and becomes it will not be able to let go of its tablet tag as long as it continues to use iOS over macOS. The iPad is definitely an eye turner and more. Remember the iPhone 5? That is exactly how the iPad Pro 20118 looks. Flat-size and light, both the 11-inch and 12.9-inch models are a sight to behold. Both versions use the LCD display. What you’ll notice straight away is the lack of a home button as Apple have kept the design method of the iPhone X. That’s right, there is now face recognition on board to unlock your device. Don’t worry, you’re not going to look silly, with the size kept in mind you will have the ability to unlock in landscape mode or portrait. That’s not all that is reminiscent of the iPhone. The hardware is also similar so you can be sure that machine learning is part of the design. So what currently happens in the iPhone will be replicated in the iPad. But as we know learning never stops. You’ll find a 12.2-megapixel camera at the back of the device, making this perfect for aunties who like to use iPads at weddings and graduations. But really can you even call this an iPad? From benchmarks, you couldn’t tell as the iPad speed is greater than some Macs ( the irony) and laptops making this one of the most powerful devices out there. Better looking. Simple as that, white finish and a flat edge the pencil has gone through a sensible but needed change. As always you wouldn’t be able to pick this up straight out the box – and I’m not sure if you should get it if you’re not doing anything other than section – but one of the good things about the new pencil is it clips to the side of the iPad due to the magnets that are built into both devices. This is only possible due to the flat side of the Pencil. When attached, an amination plays for a moment that makes you aware what your battery percentage is. This all makes sense. Why not have the pencil in a safe place and charging nearby? With the original Pencil, you would have needed to stick it at the bottom of the iPad which made it dangerous. And here is the thing. The iPad Pro 2018 is great. In fact, it is phenomenal but what continues to hold it back – which baffles a lot of us – it is Apple reluctance to do something drastic and incorporate the macOS. This isn’t to say that the iOS is terrible on the contrary it is great but for smaller devices. For example, the iPad seems to continue to use the mobile version of safari. Why? No idea, but little stuff like that which prevents performance and viewing sizes are an issue. I didn’t mind as much when the original iPads were using the iOS because it wasn’t as powerful. Not only is there no lag between closing and opening an app, but there is also a consistency throughout the device, whether you’re typing, drawing or even watching movies the iPad does all. But that’s the thing. It doesn’t. The iPad is like Peter Pan, it’s trying doesn’t want to admit that it’s no longer a boy but it’s on the way of becoming an adult. And like Peter Pan, its’ clinging on to stay the same. Identity crisis, yes, but for how long?